Fantasy Flight Games is excited to announce the 2016 Star Wars™: Imperial Assault National Championship Prizes! With its fantastic prizes, tremendous field of competitors, and exciting atmosphere, a National Championship is a part of the Championship Series and going to be a proving ground for those who plan on attending the 2016 Star Wars: Imperial Assault World Championship. International events will be taking place around the world in August and September. International players can check our list of 2016 National Championships to find out more information on their National Championship. What are the Prizes for the 2016 National Championships? Do you have what it takes to capture your bounty? 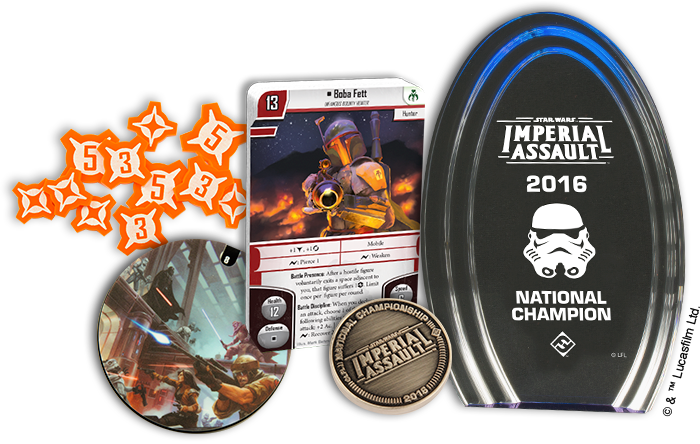 Doing well at a Star Wars: Imperial Assault National Championship will reward you with a variety of exciting prizes to show off your successes. First Place: The winner of a National Championship receives a National Championship trophy to show off to their family and friends, and a first-round bye at the 2016 Star Wars: Imperial Assault World Championship. A first-round bye will give you a big advantage over the fierce competition at Worlds. Top Four: The top four players each receive a printed acrylic scoring dial, a technological terror that can be used to track your points. Top Eight: The top eight players each receive a metal challenge coin depicting the iconic blaster pistol. If you want to win this, take the first shot you can or else you might not get another! Top Sixteen: The top sixteen players will receive a set of acrylic damage tokens. It’s tough to make it out of battle unscathed, but you can look battle-scarred in style with these! 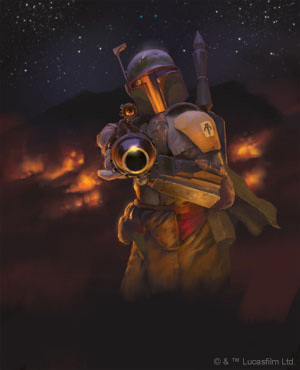 Top Sixty-Four: The top sixty-four players each receive one copy of the alternate art card for the infamous bounty hunter Boba Fett. In addition, the winner of a National Championship will earn a reserved spot at the 2016 Star Wars: Imperial Assault World Championship this November! The National Championships follow Regional Championships in the Organized Play calendar and are the next level in competition, prizes, and prestige. A National Championship is representative of the competitive communities within a nation and throughout the rest of the world. These events are not exclusive to specific nationalities, and a National Championship is welcoming of all challengers who would compete for the title. The National Championships will have unique prizes that will not be available elsewhere and ownership of them will definitely make a player stand out in the field of competition. For more information, you can read our article on the the Championship Series. What are Tournament Tier and Structure Will Be Used? Premier Tournament Tier: Tournaments at this tier expect players to have a moderate amount of experience. Players should be familiar with not only the game rules, but also the event regulations. The focus is on a competitive and fair environment. Custom Tournament Structures: A National Championship is a reflection of the competitive communities within and around various countries spanning the globe. Each National Championship is as unique as that nation itself, so each organizer will determine the unique custom tournament structure for their event. Over the next few months, competitors will attend 2016 National Championships in an attempt to win these attractive prizes and become a well-rewarded bounty hunter. Don’t miss out on your chance to acquire some of these prizes for yourself and add them to your collection!